It’s here! It’s here! The 200th post! Seems just yesterday I decided to embark on a journey of self-discovery, and worth. I wanted more out of what had become my life. I just knew there was this niche out there in the world that I could fit in to. Somehow, somewhere, someday. I was tired of waiting. Tired of timing things just perfectly – which never seemed to happen. Tired of feeling “less-than”. Why didn’t I deserve to be the one that had found my place on this gorgeous place we call Earth? On to the 200th post! I can honestly say that the one dish I have ALWAYS wanted to attempt has been Baklava. Whether it stems from the little Greek boy my Paw-Paw used to pick on me about liking at this little hometown diner the boy’s parents owned that we frequented when I was very young (that was a mouthful, hopefully you followed), or the lust for a challenge in the kitchen…I knew I wanted to make it. People always told me that it’s too much work, it’s too messy to make, too hard to work with the Phyllo Pastry, etc. Come on people, that just made me want to do it more! If you don’t know by now…I long for challenges in the kitchen! Never be afraid of something new and challenging in your kitchen (and in life)! You absolutely never know when what you take on will lead to the perfect outcome that you needed. I attended the Greensboro Greek Festival on Sunday and was able to enjoy music, dancing (I just watched, I didn’t have the credentials for traditional Greek dancing), a rare cool breeze, a couple glasses of wine, good people, and of course amazingly good food. 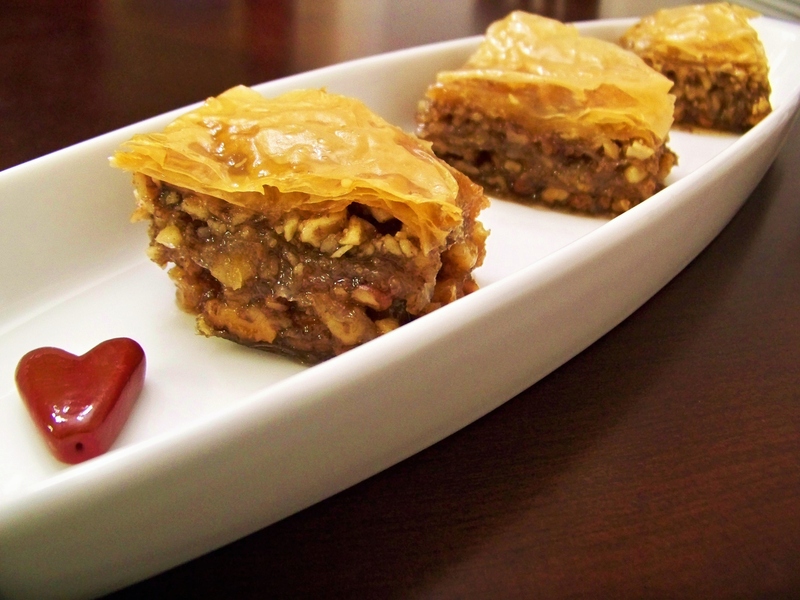 This Baklava recipe is one I saw quite a few months ago on a show I really enjoy “Chuck’s Day Off”. Chuck made a super simple Baklava, and it looked like it had all of the elements needed. Below is the recipe, and you can find the full write-up on the recipe by clicking here. Enjoy! (oops……) OPA! Preheat oven to 350 degrees F. Butter the bottoms and sides of a 9 by 13-inch pan. 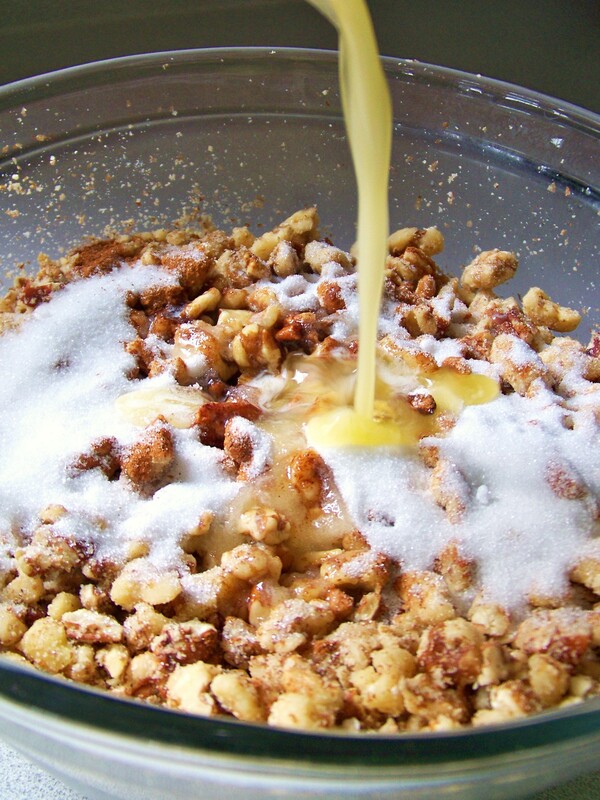 Mix the nuts with cinnamon, 1/4 cup sugar, and 1/4 cup of melted butter. Set aside. Unroll the phyllo pastry. Cut the whole stack in half to fit the pan. Cover the phyllo with a dampened clean kitchen towel to keep the phyllo from drying out as you work. Lay 2 phyllo sheets in the pan and using a brush, butter thoroughly. Repeat until you have 6 sheets layered. Sprinkle 1 1/2 cups nut mixture on top. Layer with 2 phyllo sheets, brush with butter and add nuts to end up with 4 layers of nuts and dough. The top layer should be about 6 to 8 phyllo sheets deep. Using a sharp knife, cut diamond or square shapes all the way to the bottom of the pan. You may cut 4 long rows then make diagonal cuts. 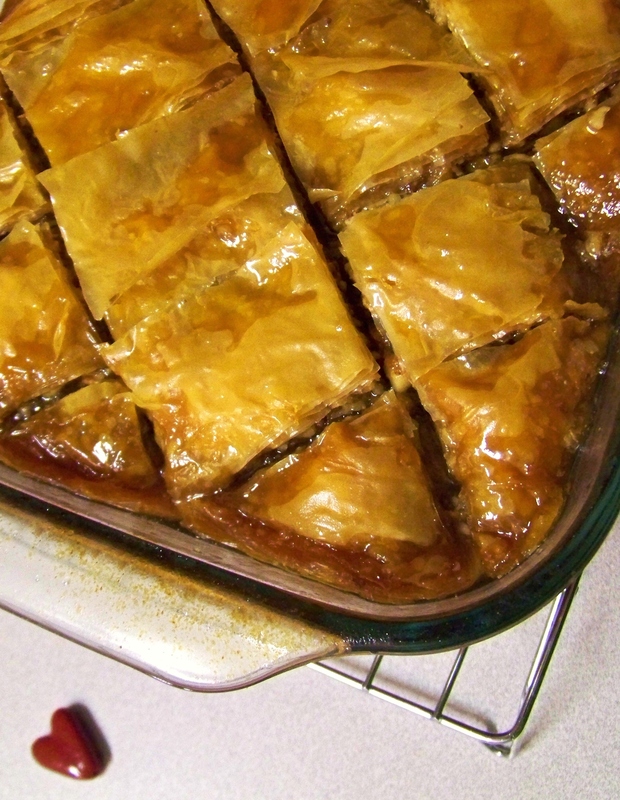 Bake for about 50 minutes, until the baklava is golden and crisp. Make the sauce while the baklava is baking. Boil the water and remaining sugar until the sugar is dissolved. Add the honey and vanilla. Simmer for about 10 minutes. In the meantime, place the grapes on a baking sheet, drizzle with olive oil and remaining 2 tablespoons sugar. Bake in the oven for about 10 minutes, until the grapes start to burst. Serve the baklava with Greek yogurt, the baked grapes and a drizzle of honey and crushed walnuts. Cook’s Notes: Walnuts can be replaced by any kind of nuts or a combination of nuts. (I used 4 cups of walnuts, and 2 cups of pecans. )Phyllo pastry is available in the freezer section of most grocery stores. Congratulations on your 200th post! I am so happy you have found your joy. Baklava??? I will get mine today!! Can’t wait to try it and pretend I am sitting with a glass of wiine watching the dancers under the shade of friendship and love. I’m glad you enjoyed it! This is an amazing recipe! Thank you, Mom! Congratulations! I’m glad you found your place in the world of the web! We lived in the Middle East for a few years, and baklava was a very common dessert. I never found a baklava I didn’t like! Thank you, Margie! This was an excellent recipe. You should try it! What was your favorite dish while you were in the Middle East?